I found some pictures that show the difference between a torch coral and a long tentacle fungia. 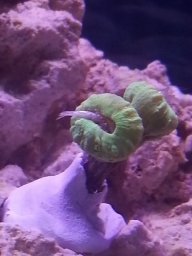 I think I have the same torch coral. I got mine with one head a year ago and it has 4 now. A couple of weeks ago I noticed this large bubble coming out of it. I heard it was because it was preparing to split. I don't know if that's true though. Yes, bubbles in Euphylias are quite common. My frogspawn gets them, and it has split loads. Whether the two are connected I don't know. Certainly nothing wrong though.